Identifier is exactly "2006-0885-F Segment 10"
This collection is the tenth segment of materials related to the Health Care Task Force. It includes the files of Robert Boorstin, Alice Dunscomb and the Health Care Delivery Room Central Files, also referred to as the General Files. The collection contains calendars, correspondence, memoranda, newsletters, polls, reports, statements, talking points, and drafts of Health Care Economics, Health Care Reform and the Health Security Act. 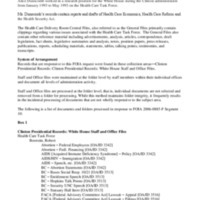 The General Files primarily contain clippings regarding various issues associated with the Health Care Task Force as well as advertisements, analysis, articles, correspondence, draft legislation, fact sheets, legislative summaries, notes, position papers, press releases, publications, reports, scheduling materials, statements, tables, talking points, testimonies, and transcripts.